A new weakly electric mormyrid fish genus of two new species has been described from only three specimens collected over a period of 13 years in the rivers of the Central African country of Gabon. 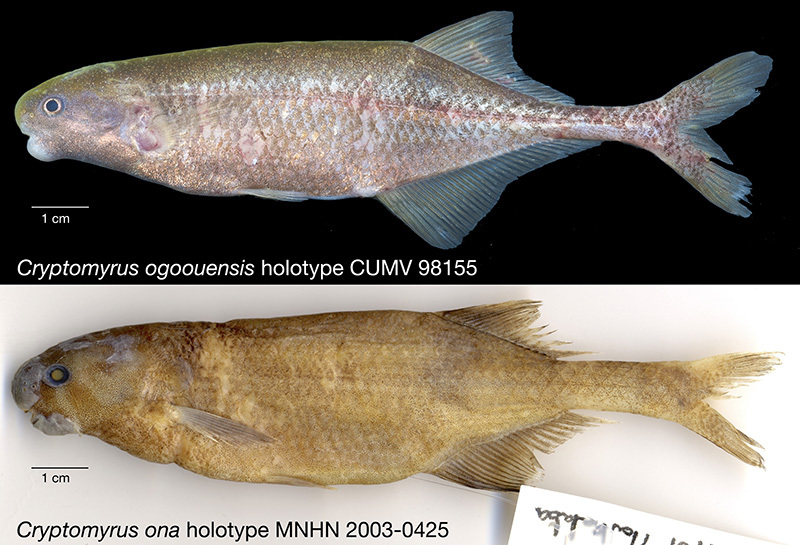 The genus has been named Cryptomyrus, meaning ‘hidden fish’ in Greek, and is the first new genus to be described within the family Mormyridae since 1977. The study, authored by Dr. John Sullivan and Prof. Carl Hopkins of Cornell University, Ithaca, New York, and Sebastien Lavoue of the Institute of Oceanography at the National Taiwan University in Taipei, Taiwan, is published in the open-access journal ZooKeys. “It’s odd we have only three specimens, given how much fish collection effort there’s been in Gabon over the past years,” says lead author Dr. John Sullivan. “Not having more made the descriptions difficult, but it was important to bring this discovery to light without further delay.” Sullivan added that he does not know if these fish are rare throughout their range or if specialists simply have not sampled localities or habitats where they are common, yet. “It shows that we still have a very incomplete picture of fish diversity in Gabon,” says Dr. Sullivan. The last of the three specimens was found on an expedition to Gabon’s Ogooue River in September 2014, jointly sponsored by CENAREST and The Nature Conservancy. It was after nightfall on the Ogooue, beside Doume Falls, when Sullivan and the other team members caught the one odd fish in a plastic fish trap baited with earthworms. Reflecting its river of origin, the species now bares the name Cryptomyrus ogoouensis, while the second – Cryptomyrus ona, is named after Gabonese environmental activist Marc Ona Essangui. Analyses of the DNA from the three specimens conducted at Cornell University showed they were close relatives and did not belong within any recognized genus. “That left us no choice but to describe them as a new genus, and Cryptomyrus, which means “hidden fish,” seemed an appropriate name given how hard they are to find,” said Dr. Sullivan. Over 200 species of mormyrid fish live in fresh waters across Africa where they orient to their environment and communicate using electric pulses, too weak to be felt by humans, in combination with highly sensitive electroreceptor cells embedded in their skin.